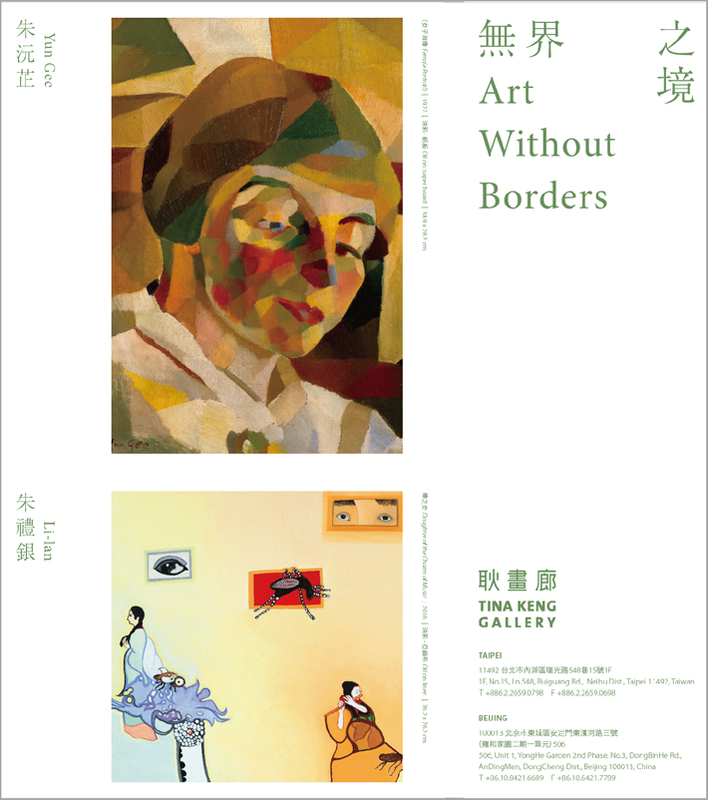 The exhibition title “Art Without Borders” aptly encapsulates the transcultural journey of the father-daughter duo Yun Gee and Li-lan. A forerunner in Greater Chinese modern art, Yun Gee moved to San Franscico in the 1920s, where he translated his cultural experiences into versatile artistic styles that were readily embraced in European and American art circles. Similarly, through the act of painting, Li-lan blends her life experiences with Chinese and Japanese cultural symbols in an expressive artistic language that speaks universal truths about the human condition. Delving into ideas of immigration, cultural identity, and personal identity, this exhibition resonates with Yun Gee’s lifelong practice. Immigrating to San Francisco at the age of 15, Yun Gee developed a seminal style that grounds vibrant, bold color blocks in cool, rigorous delineations. A style that found its roots in Cubism and flourished under the influence of Synchromism, championed by his mentors at the California School of Fine Arts. Being in a foreign land, suppressed by racial bias, he became wistfully nostalgic for his mother and home country. This melancholy yearning nurtured his art as well as his conviction that he deserved recognition for his cultural identity. His later move to Paris, exposed Yun Gee to significant European influences. Earnestly embraced by the Parisian art circle, his work instantiated the fusion of East and West in the ingenious synergy of Chinese cultural symbols and Western painting styles. Social upheaval in the 1930s sent Yun Gee back and forth between Paris and New York. But in 1932 he was invited to be in the group exhibition Murals by American Painters and Photographers at the Museum of Modern Art in New York. For this exhibition he created the work Wheels: Industrial New York rendered in his singular “Diamondism.” Profoundly influenced by Synchromism, Diamondism focused on a rhythmic organization of edges and facets, as well as hot and cold color contrasts. It embodied Yun Gee’s attempt to explain the intellectual, physical, and psychological coordinates of artistic creation after much contemplation about China’s tradition, philosophy, and culture. This fortified Yun Gee’s status as one of the pioneering Chinese modern artists in history, as well as marking a milestone for Greater Chinese artists. Yun Gee’s artistic journey unfolded in San Francisco, and led him across oceans and lands to Paris and New York. His diverse body of work genuinely reflects his nomadic experiences over the years. Chronicling the critical period between 1926 and 1956 that defined Yun Gee’s eclectic practice, Art Without Borders comprises a precious, rarely seen array of works on paper and oil paintings that shed light on the conception of Wheels: Industrial New York. Nurtured in a transcultural heritage like her father, Li-lan has chosen a divergent path to express her life experiences. A meticulous composition pregnant with potent cultural symbols transports the viewer to Li-lan’s fanciful world that pulsates with her musings. In the early stage of her practice, the artist collected stamps, envelopes, and postcards — ephemera that embody her communication with friends and family across the sea. By turning these ephemera into her painting subject, Li-lan reminisces about her past journeys and imagines herself traveling to exotic lands. Her depictions of human figures, amphibians, and insects act as reminders of fleeting memories and bygone times, abounded in an earthly transience. Her transcultural background inspires her use of multifarious cultural references, in a way as a response to her own identity. Art Without Borders mirrors Li-lan’s past 16-year practice, where she transforms the changing states of her mind, as well as the ruminations on her cultural and personal identity into paintings that have emerged from the artist’s restrained, tranquil contemplation. Juxtaposing the two distinct bodies of work by the father and daughter, Art Without Borders creates and contrasts parallels in both artists’ practices, as an attempt to accentuate the generational and environmental differences that have immensely shaped their work. Transcending geographical and psychological boundaries, Yun Gee and Li-lan cross socio-cultural thresholds into the boundless realm of art.